Nike selected the controversial former San Francisco 49ers quarterback Colin Kaepernick as the new face of the athletic wear company’s “Just Do It” campaign, which is celebrating its 30th anniversary. “Believe in something, even if it means sacrificing everything. #JustDoIt,” Kaepernick, who has been with Nike since 2011 though hasn’t played on an NFL team since the 2016 season, posted on Twitter on Monday afternoon. Folks, we’ve talked a lot about bubbles. The Democrat-Media Complex bubble that kept liberals insufferably arrogant during the 2016 election, confident that Hillary Clinton would win only to see their whole world burned to ash. The Acela Corridor bubble, where people are shocked to learn that most of the country doesn’t have a college education. In fact, a lot would be shocking to this snobby slice of America. I grew up in this cesspool. And while my county was reliably Republican, you were never a stone’s throw away from some liberal who view the rural voter as some sort of alien creature. Well, in sports, we have a huge bubble, and I dare say—it might be denser than all of the ones that liberals currently inhabit to deal with the Trump era. Kaepernick is divisive. He might have been playing for the Baltimore Raven if his girlfriend hadn’t gone off half-cocked on social media, heavily insinuating that the owner was a racist. Former All-Pro linebacker (and Hall of Famer) Ray Lewis was aghast by this last year. How has the NFL fared since? Not well. No matter how you cut it, people desecrating the flag, or kneeling during the national anthem, will not bode well with the public. We’re a patriotic nation. We’re proud to be Americans. You may have the right to kneel during the Star-Spangled Banner, or burn a flag, but be prepared to be rightfully crucified for doing so. It’s no longer cool; it’s an act of jacka**ery. And no matter how noble your cause will be, the message will be lost. People see this as one thing: disrespecting the country, our veterans, and the people who have died for our freedom. These players who participated in these antics got the attention, but not the right kind. Now, the NFL has suffered ratings drops and declining ticket sales. It’s now a heavily polarized cultural event. A majority of voters say that it is not appropriate for NFL players to kneel during the national anthem to protest racial inequality in the United States, although the country is deeply divided on the question along partisan and racial lines, a poll released Friday from NBC News and The Wall Street Journal shows. 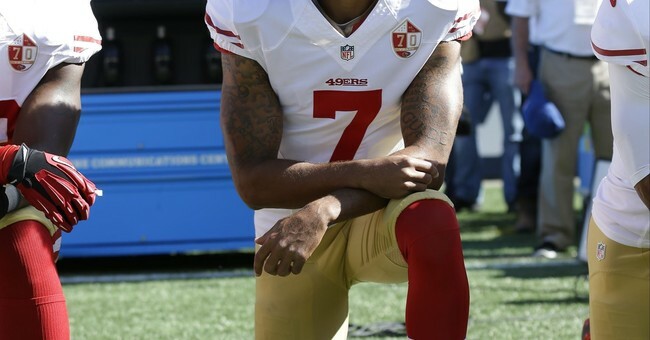 The survey found that 54 percent of voters called kneeling during the anthem inappropriate, while 43 percent say that it is an appropriate way to bring attention to the problems that NFL players and others have cited as the reason for their protest. So, what does Nike do? Make the guy who pretty much politicized football the face of their Just Do It campaign. This is almost as bad if not worse than the decision to allow male cheerleaders. We don’t want to see that crap, and we wish Kaepernick would just go away. Football used to be a time where politics can be put on pause, liberal couldn’t tolerate that. Remember they will make you care. Nike stock has opened down 2% in premarket trading in wake of Colin Kaepernick ad deal. Would shave roughly $250 million off market cap.